This 10 week course costs £15 and includes refreshments and course materials. We also provide a creche for those who need it. The Circle of Security group was fantastic. A real eye opener. It helped me and my little girl reconnect. I was able to approach the way I dealt with time out in a completely different way. We are now so much closer and she is able to say exactly how she is feeling without having a full-blown paddy. It has also helped me to understand how I can help with my children's development without taking over, offering help and reassurance when needed. 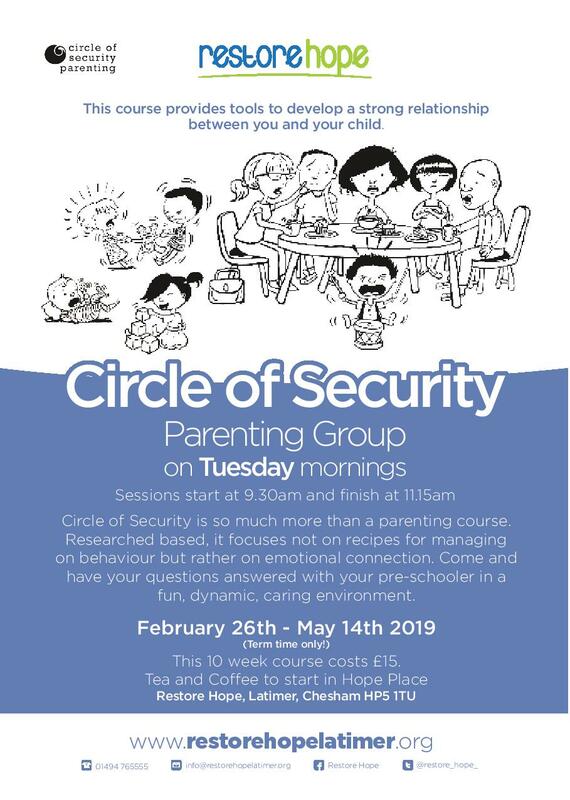 Circle of Security is so much more than a parenting course. Research-based, it focuses not on recipes for managing behaviour but rather on emotional connection. Every child is born longing for this close connection with his or her primary caregiver, and during the sessions we shall look at tools to develop a strong relationship between you and your child. It’s accessible, doable and remarkably effective! The course runs over 10 weekly sessions, where an informal and supportive atmosphere encourages debate and ensures that everyone’s views are respected. For many of the parents who have come along, the revelation of a new way of ‘being’ with their children has been life changing. During this past year, Restore Hope has joined with local mothers’ groups, church toddler groups and parents’ groups ….and the response to the material has always been the same. It’s an emotional revolution! Difficult relationships have been turned around; children who lack self confidence begin to discover a new belief in themselves and childhood tantrums have become an opportunity for parents to connect with the feelings behind the outburst.